1999 Nigerian Constitution, as amended. representing 109 senatorial districts in the country. political history. 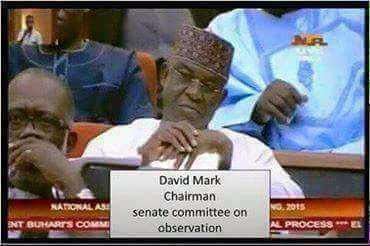 He has been in the Senate since 1999.
between June 2007 and June 2015. Mark has gone into political obscurity. are also expected to fulfill this constitutional obligation. committee chairmen in late 2015.
maintaining a solitary posture among his colleagues. pressing issues in the country. to his seat the few times he has attended plenary. before the end of the day's plenary.